But it’s obviously not as simple as this, as anyone who has struggled to fall asleep at night has experienced, and that is in part due to the fact that our circadian biological clock regulates the timing of periods of sleepiness and wakefulness throughout the day. So if you’ve ever felt more sleepy at noon than midnight, that’s most likely a result of your circadian rhythm. 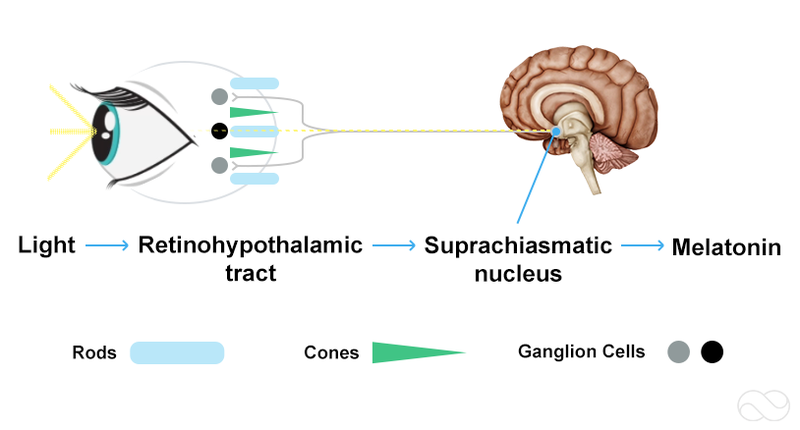 The circadian biological clock is controlled by a part of the brain called the Suprachiasmatic Nucleus (SCN), a group of cells in the hypothalamus that respond to light and dark signals. As it turns out, the retina of the eye contains “classical” photoreceptors (“rods” and “cones”), which are used for conventional vision. But it also contains specialized ganglion cells that are directly photosensitive and project directly to the SCN where they help regulate this master circadian clock. In the mornings prior to awakening, the SCN sends signals to raise body temperature and produce hormones like cortisol, helping the body wake up. In the evening prior to bed, the SCN sends signals to lower body temperature produce hormones such as melatonin, helping the body to go to sleep. Using light to regulate circadian rhythm is not new or novel, in fact, it is well established and there are numerous products already available that do just that. But these “traditional” light therapy devices use continuous bright light, much like the light you would get from natural sunshine, and require sitting in very close proximity to bright light for an hour or more every day. Many people find these treatments to be impractical though, as they can’t regularly find the time to sit in front of the light long enough to be effective. Several studies have found that the attrition rate for light therapy is between 20- 50%, even in instances where an individual had previously found light therapy to be effective! The technology used in the Lumos Smart Sleep Mask is distinct in that it exploits another feature of the neural pathways that regulate your circadian clock: the specialized photosensitive ganglion cells that talk to the SCN turn on in response to light very quickly and turn off quite slowly. This means that a very short pulse of bright light will fully activate the ganglion cells and cause them to start sending signals to the brain, which they will continue to do without any further input for an extended period of time (as high as 100,000 times the duration of the light pulse itself). So brief pulses of light separated by relatively long intervals can be used to reset your circadian clock, and that is exactly what our technology does. Because light can penetrate your eyelids while you sleep, and because these pulses are too short to disrupt sleep (as demonstrated in clinical trials done at Stanford University), short light pulses can be used while you are sleeping and during the time when your circadian rhythm is naturally very sensitive. When introduced in a sleep mask, this provides a highly effective, convenient, and portable alternative to traditional light boxes, and something we believe has the potential to change the way people approach sleep and travel. ◄ Lumos at ACTE Paris 2018!